Those of us who lack the always enviable skill of artistry, especially that skill of painting can rejoice, finally, that there is now an alternative to colour-by-numbers and those adult colouring books (which failed my expectation on the adult front) with Sunset Over Water, a lightweight, quick game of painting landscape masterpieces and selling them off. Warning: This review was written with a thesaurus close at hand, primarily used for synonyms of charming and delightful, because, well, Sunset Over Water is both charming and delightful. Indeed, you will be enchanted by the simplicity of the rules, and you’ll find the artwork presented on the landscape cards to be quite enchanting, but there is more to this game than meets the eye, in fact, you’ll have a very jolly, if not somewhat twee and bohemian time playing this little gem. 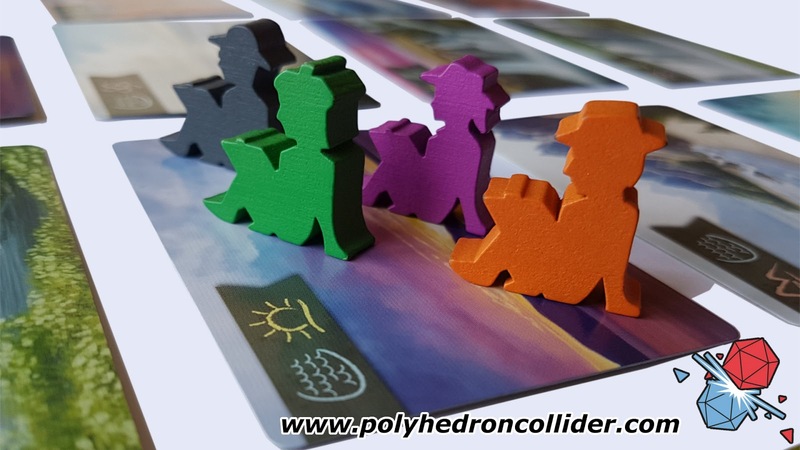 For this game, you need not a beret, paintbrush, easel or pallet, just your eight little action cards and your colour matched lazy-arsed, yet fetching artist meeple, posed sitting down, staring off into space not really doing anything. 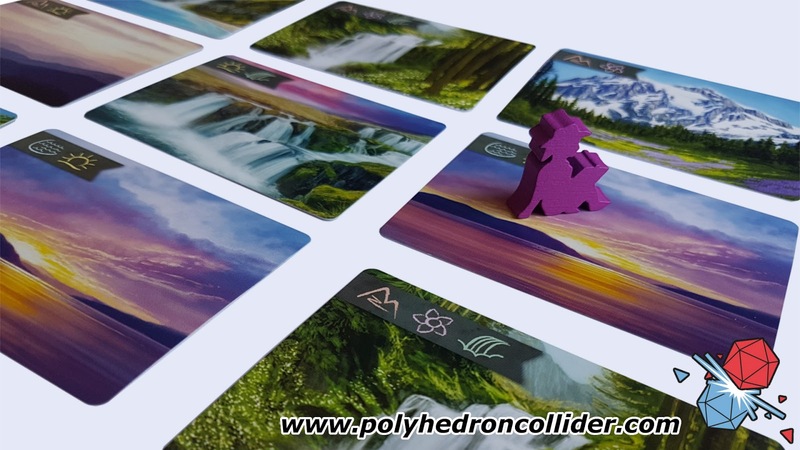 Twenty-five landscape cards are arranged in a five by five grid, a number of art studios (one more than there are players) advertise for specific commissions, and then there are the typically artistic daily goals to be attempted. Now, before you actually start playing the game take a moment to stop and smell the roses-look at this tremendous and beautiful artwork, then consider the very accessible, easily understandable and yet utterly understated graphics present on the top left of each card. Sunset Over Water is a simple, beautiful and graceful set collection game, that wants you to take your time with it, to enjoy each turn and minute spent playing. Each turn you’ll draw three of your action cards, select one and once all players are ready you’ll reveal that chosen card. 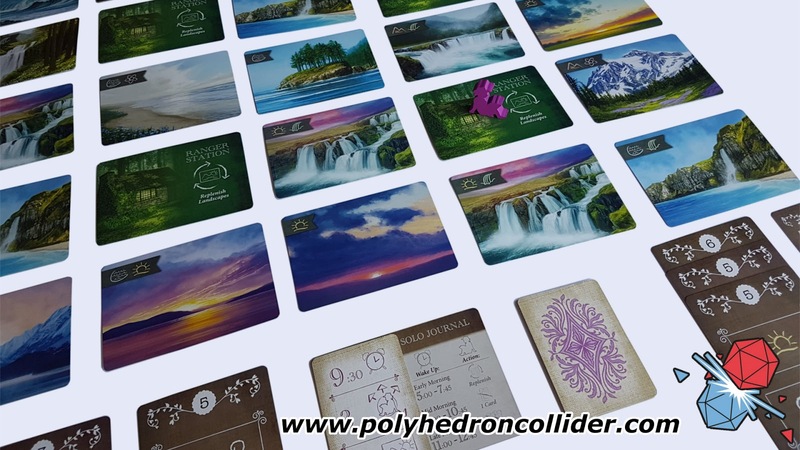 A neat aspect here is that the two you rejected are placed at the bottom of the deck, in the order of your choosing, meaning they will reoccur in a later turn, or as they are amusingly referred to in this game, days, making the game six days long. 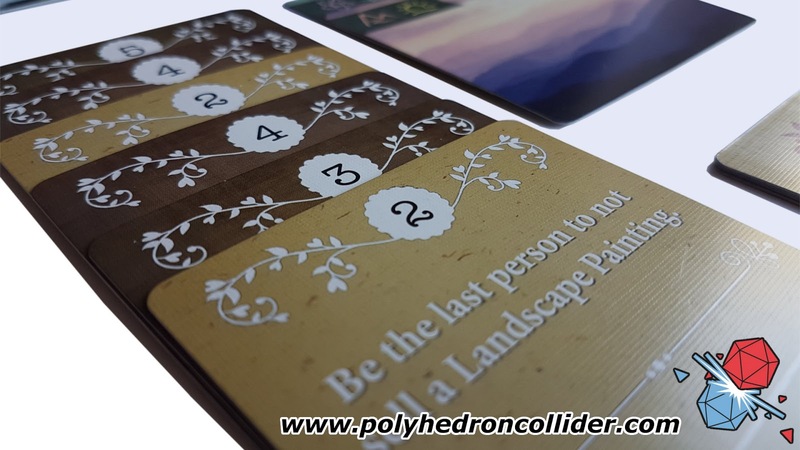 These action cards dictate the time of the day you’ll awaken (turn order), which direction you’ll hike with a canvas under the arm, and how productive you’ll be by the number of landscapes you'll paint. 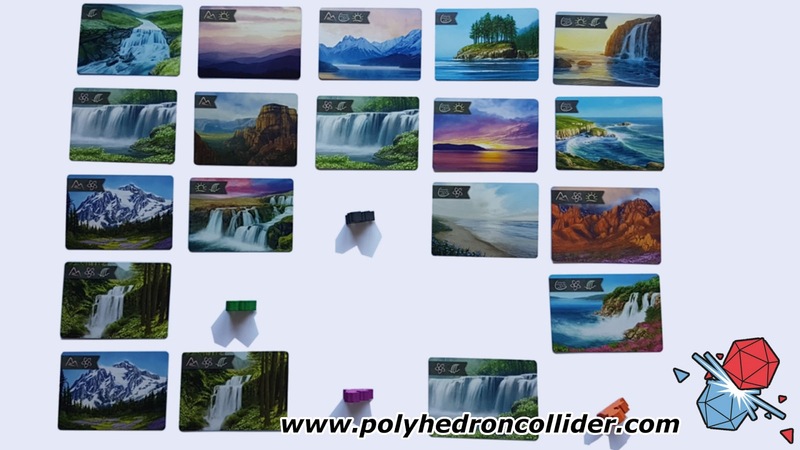 These cards all have typically varying limitations such as an early start but not much movement and only one painting, against sleeping until noon and still managing to paint three lovely landscapes. The simplicity of these choices and the scope for error are engagingly juxtaposed, you’re all working towards the same commissions, you can all see the same possibilities, your previous positioning in the play space, the cards you declined for later use all come together in a fascinating mixing pot. 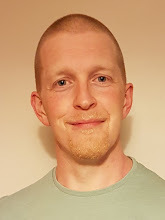 And those days fly by, the actions, once chosen are rapid with commissions flying out at a sometimes alarming rate-particularly for the artist that had a lie-in. It's still early in the week and I'm off to a great start. The early bird n'all. Sunset Over Water does apply a soothing balm for the last player though, that although may not feel like much at the time (each Daily goal is worth but a lowly 2 prestige points) these soon stack up. Awarded for the player to last perform an action, such as move horizontally, or to end in a corner: always the last player tough. This catch-up mechanic does feel very, well, mechanical and so stands out a little from the otherwise delightful and unobtrusive rule set but is a necessary system within the game. The captivating artwork that I have gushed about all through this review, is, however, not beyond critique; the one simple flaw being its duplication. On the one hand, I can appreciate that sixty unique cards would have had an impact on the price, but there is a small pang of disappointment often accompanied by an audible “Oh” when the same landscape artwork occurs on adjacent cards. It’s like going to the sandwich fridge at the shop, seeing it fully stocked but then realising it has only Tuna Cucumber and Egg Mayo available - yes, they’re sandwiches, and yes, they’ll do the job, but one can not help but be a little dissatisfied, and left wanting just a little bit more; like a coronation chicken, or maybe something with pickle. Sunset Over Water also sports a solo mode, which I was pleased to see in a game that is about a very solitary pursuit, and happier still to find it an equally absorbing puzzle - this mode introduces a vexing variability to the available commissions by way of the alarm clock system used in the multiplayer, and Ranger Stations which cannot be painted but are one of the few ways to replace the vacant slots from previously painted landscapes. 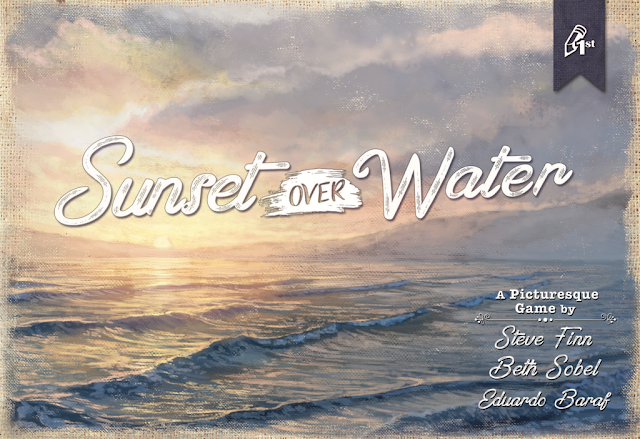 This pleasingly minimalistic set-up from simple, yet considered insert makes Sunset Over Water very quick and easy to set up, and more importantly, to refresh - which given the brevity of this game is, I think, is a huge part of its appeal. This game is very light, offering fun and interesting choices in small doses. I cannot help but feel the similarity between this and Splendor, not that this is a contender to that game’s shelf space, but it feels like a relative to that modern classic. There is little in common mechanically, really but there is that sense of familiarity between them. A game about painting pictures, should, and in this case does, have artwork at its very fore - making the game hugely accessible and I really wouldn’t be surprised to see this box soon gracing the shelves of a Waterstones or Borders near you. It certainly wouldn’t be out of place in the gift shop of an art museum either, albeit a more forward-thinking one. It is light, quick fun, with enough allure to make it a welcome visitor to my gaming table again and again. With a theme and art that really is alluring, this game can be introduced and enjoyed by new or veteran gamers, young or old.